Falling prices and government mandates are set to boost sales of electric vehicles globally, making owning and operating charging infrastructure an attractive area for investment. Charging infrastructure in North America will draw $18.6 billion by 2030, according to a report by Wood Mackenzie Ltd. published Aug. 2. It’s not just North America that’s benefiting. There will be as many as 40 million charging points globally by 2030 as electric vehicles are forecast to make up about 11% of new sales, the report said. “The EV charging infrastructure ecosystem is very complex, and most projects require strong partnerships between both public and private stakeholders to deploy necessary infrastructure,” said Timotej Gavrilovic, research analyst at Greentech Media, the division of WoodMac that wrote the report. Although opportunities will be slow at first, companies soon will see swift growth, he said. The global fleet of electric vehicles is likely to more than triple to 13 million by the end of the decade from 3.7 million last year, according to a report by the International Energy Agency. Sales may soar 24% each year on average through to 2030, with China expected to become the biggest market. 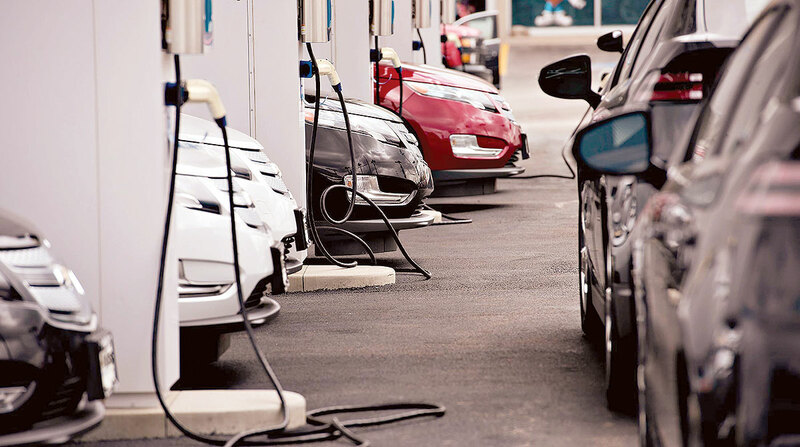 Big oil companies such as Royal Dutch Shell and BP are looking to translate their petrol forecourt success to the electric vehicle charging market. They are likely to have to battle for market share with utilities and technology companies that also see charging as their natural territory.